Both sculptor and draftsperson, Segre is known for oversized, organic sculptures and crowded linear drawings. 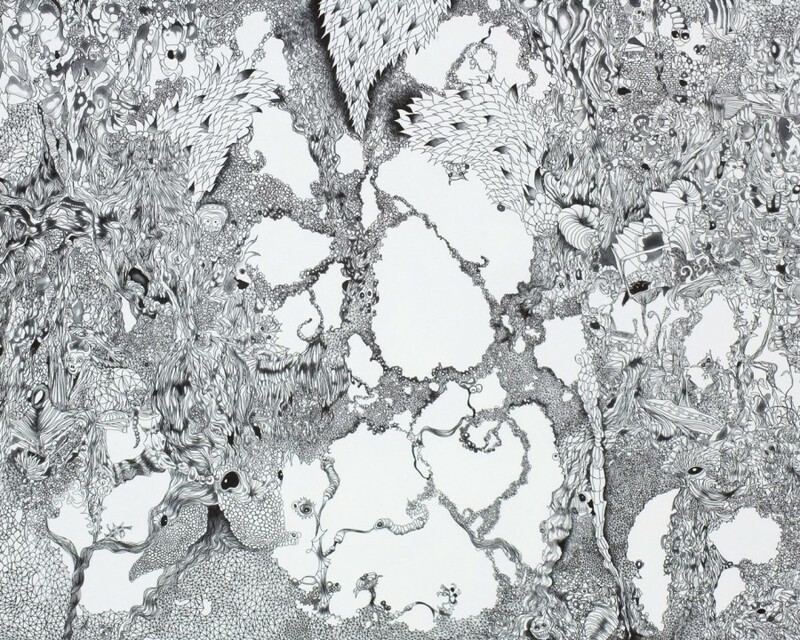 She approaches each medium with microscopic attention; her works are highly detailed and finely realized studies of entropic growth and disintegration. 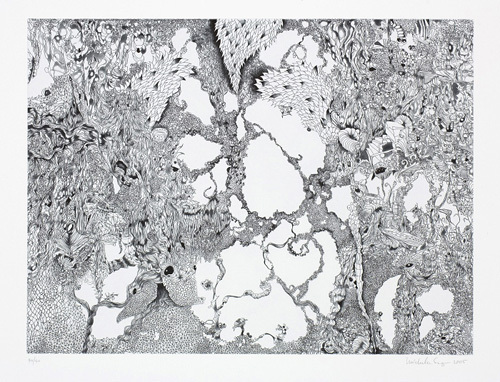 In her first print, Swamp Eyes, 2005, Segre used both line etch and spit bite aquatint to create a densely populated garden-like landscape of unfamiliar creatures. Webbed in by linear patterns emulating the organic structure of crystals, the details of the picture ebb and flow with the viewer’s eye, coming into focus and then disappearing again. Camouflaged numbers (birthdates, addresses) and letters are momentarily evident, appearing as hidden clues. The longer one looks, the more one sees, yet an attempt to decipher the composition leads only to further questions regarding subject, scale and surface. Like Alice in the rabbit-hole, the viewer loses their sense of place as participant, and remains a furtive onlooker. When making her drawings, Segre uses ink or gouache; both irreversible mediums. The permanence of the etched line provided Segre with a similar mark-making experience. After drawing on the plate, her lines were etched generously, mimicking the linear solidity of her drawings. The difficulty of rethinking (or erasing) a composition of etched lines reinforces the meditative, stream-of-conscious characteristic of her work. Segre’s shadowy spitbite helps to locate figures and events within the detailed activity, and was applied with sensitivity to tone and tonal gradation. In addition to solo exhibitions in New York and Los Angeles, Segre has been included in several group shows in the United States and abroad, among them the recent “Greater New York” at P.S. 1 Contemporary Art Center, Long Island City, Queens (2005), “Curious Crystals of Unusual Purity” at P.S. 1 Contemporary Art Center (2004), “Ballpoint Inklings” at K.S. Art, New York (2003), “By Hand: Pattern, Precision and Repetition in Contemporary Drawing” at the University Art Museum, California State University, Long Beach, CA (2001), “Almost Warm and Fuzzy: Childhood and Contemporary Art” at P.S. 1 Contemporary Art Center and Fundacio la Caixa, Barcelona, Spain (2001), “Fresh: the Altoids Curiously Strong Collection” at the New Museum, New York (2001), and “Here: Artist’s Interventions at the Aldrich Museum” at the Aldrich Museum of Contemporary Art, Ridgefield, CT (1998).